Loads more machine as a matter of fact! After a brief hiatus due to vacationing in France's lovely Bordeux region, I've finally finished the Actaeon Heavy Assault Servitor (Jaeger just didn't sound '40k' to my ears). Now I'm going to go back to crying quietly into my pillow - trying to come to terms with the complete and utter disaster that is the Age of Sigmar book. I really tried to stay positive to the last and push away my initial sceptisism ( after all I forked out 55 euros for the damn thing ) but after having read the book I truly belive GW completely dropped the ball with this one. There's admittedly a few interesting ideas in there, along with beautiful photos and a few really nice illustrations. However those are quickly overshadowed by the poorly edited and ponderous, inept writing. Also the confusing lack of an actual games system and general lacklustreness of the tome makes it the least appealing GW product I've ever had the misfortune to come across. Warhammer needed to change, but this was certainly not the way to do it as far as I'm concerned. It really feels like the "Phantom Menace" moment of the tabletop world. That is an incredible paintjob. Top notch conversion too. "It really feels like the "Phantom Menace" moment of the tabletop world." I completely agree with your analogy of AoS. Like I mentioned on the Oldhammer forum a short while back, if any other company tried to release this game it wouldn't even get off the ground. A lot of fan boys are extolling it's virtues, without looking at it objectively (as a stand alone product), forgetting that it's a GW product. Throwing the baby out with the bath water was not the answer to WFB's woes. Hmm... I don´t really get what you´re after when using the word "fanboys" as a derogatory term? After collecting their miniatures for 25 years and even starting a blog about warhammer minis I consider myself very much a fanboy of GW. The term "fanboy" refers to fans who are blind to any negative aspect of their hobby. No matter how blatantly obvious it is! It wasn't a reference to you. Haha.No I get that - I´m just trying to point ot that we´re all fanboys in some way or another so one should perhaps be careful using a term like that. You collect GW models as well - you just prefer the old ones. Doesn´t make you less of a fan right? It's easy to see that it might mean different things to different people. After all, it's just a made up word that popped up among gamers few years ago. But to me, the word always meant people who blindly love everything that "a" company does....without judging products on their own merits. See a lot of that with regards to GW. Take the AoS release for example. Anywho, each to their own & all that. Well I spend a god awful l amount of time looking at GW's decision with despair and a heavy does of criticism. However I'm realy looking forward to playing AoS and every report of someone actually playing the game has been very positive. Several people have stated that the level of tactics and model positioning is is a lot more complex than it would at first appear. My games group is definitely looking to get into it as a game, it just makes it much easier to play when you only need a handful of models to play. The term fanboy is so often used by people who just want to hate, yes there are in all hobbies those who fail to understand that constructive criticism is given by people who want the best out of the thing they love. But there are just as many who just want to hate. I piked up the book in mobile format and I've got the core set and hardback novel, by and large I've found it enjoyable if somewhat disjointed in writing style and timelines. To truly judge something, get some games in, I see a lot of scope for realy small games and playing it like Mordhiem and then realy big games. Just wish I had the time to get those games in. I wish I could be so positive. I really wanted to like this game but as the writing, illustrations and setting was what got me into this hobby, just as much as the models, these things are extremely important to me. Reading some sentences in the AoS books (I´ve read got both the one from the starter and the big hardback) literally made my brain hurt. The english is so bad at times its barely legible. While GW sourcebooks was never Nobel price material it used to be quite well written. When presenting a new world one should take more care presenting it properly - and at the very least proofread it. Servitor is looking absolutely epic! The shield is my favorite part although the choice of head and those chevrons on his fist are also inspired! Cheers! The chevrons were a lot of fun! I'm with you on that. Carrying over the details on the shield helps tie your Mechanicus models together. The paint job on the other models has always been striking, but I think this one really works in a way that the others hadn't quite reached. What I mean to say is that you've taken something exceptional and made it breathtaking. Keep up the amazing work. You really turned the best out of this...not sooo good GW kit. 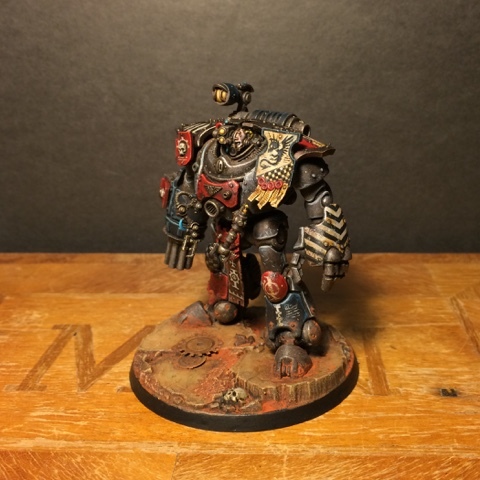 Lovely conversion job and a more epic paintjob man! Very impressive! Thanks! It´s a strange piece of kit but with tons of potential. As always your work is brilliant that beast looks epic and a true bad arse. Can realy see some scrawny tech priest negotiating with a much more hostile and scary inquisitor or even space marines, full of confidence and snide smugness because that hulk is behind them. Haha! Thats a great image! Truly awesome. I was waiting to see how uour painting would blend it in with the rest of your warband, and it really does nicely. It looks great. 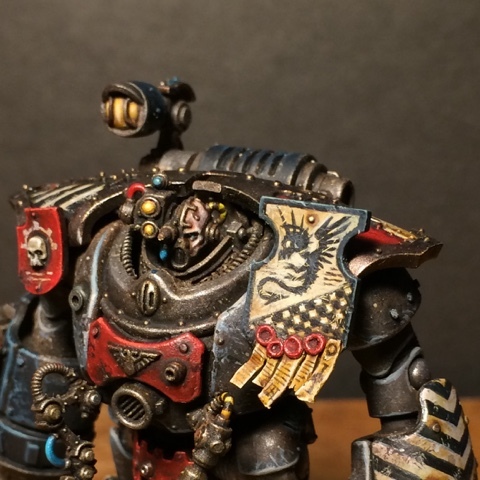 All the details you have painted has really bought it alive and the modifications really vhange the feel of the model to something more dark and sinister. Great job! That is a beautiful reinterpretation of that model. It still has the imposing pose, but just the right amount of gothic. Terrific paint job as well, absolute cracker. 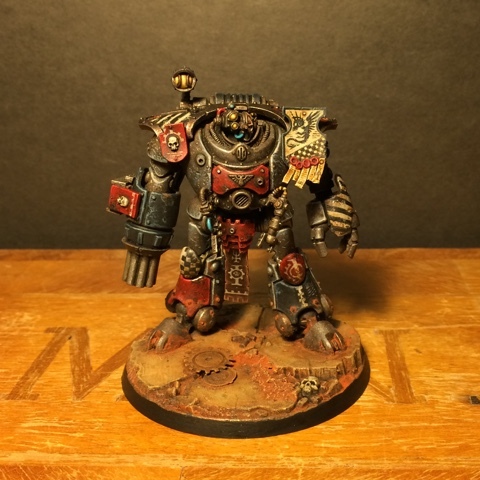 Awesome mini and freehand work, Jeff. So many little details to catch the eye. I've played a few games of AoS and it's really fun. It feels like playing old Warhammer back before it became "mathhammer". Creating narratives, having a chat with your opponent about army composition and getting down to some custom scenarios. When it comes to the fluff I think as much as I loved the Old World, they had done all they could with it and fiction set in such was starting to become quite stagnant. The End was always on the horizon, and I think that it has created a broad new canvas for us narrative game types to paint on. The Old World will always be there go go back to when we so wish. I've got a large bookcase of fiction that proves such. However that still doesn´t excuse the poor writing - I´m not even talking about concepts and ideas here, but the basic ability to form sentences and a captivating text. The book is just unbelieveably poorly written at times. And sadly the - grammar and spelling aside - what little information about the new world one can gather fails to intrigue me. If I don´t like the background - if the sourcebook doesn´t captivate me - I´m not interested in the game no matter how fun it is to play. Your last remark is precisely why I can't play Infinity no matter how good everyone says it is. On topic however,I think they could have done a lot more with the background other than letting the whole world end. It's been the End days of man in 40k for a loooooong time. From what I can infer I think they added the whole realmgate concept to try and make the in game universe as large as 40k's to prevent such things in the future but I still think it could have gotten a better treatment. Then again the only fantasy I've ever considered playing was Mordheim. Amazing miniature. It just oozes weight and power. And your fantastic paint-job gives it a healthy dose of realism. And as always your weathering is wonderful. I find more and more that I'm not that taken with GW's colour schemes, they tend to turn me off new miniature releases. 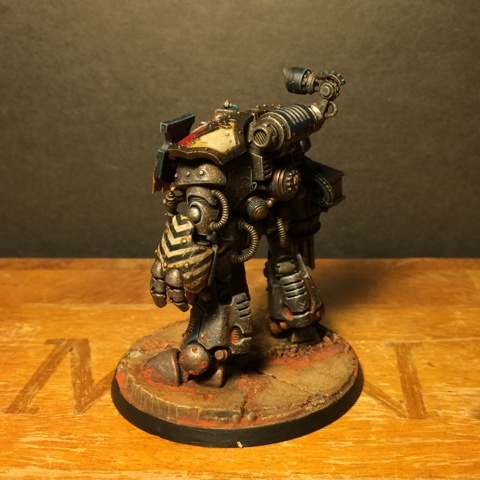 But then when I see someone else' paint-jobs the miniatures are just brought to life and I give them a second glance. As far as Age of Sigmar is concerned. I've had a few games and the simplicity is deceptive, there are tactics involved you don't realise until you play a few times. It is a fun ruleset, it just doesn't provide the same feel of game that most fans of mass battles are after. Myself I plan on having my cake and eating it, I'm using AoS and 8th ed WHFB. 8th for mass battles, AoS for smaller, quick skirmish games set in the Old World. The rules proably work fine when you play - that's not really the problem. I do really miss some sort of army selection system though. I doesn't have to be points based but something to provide some sort of structure when collecting an army. Love this piece of work really shows what can be done with models that somethimes lack that certain something. AoS, Hmmm difficult one having played it, not so much impressed as other games play like and better. This really would have been better as a mash-up with Mordheim and had art by John Blanche. That is one fantastic looking robot! The gatling cannon and head swap give the model a much different feel and fit really well. The choice to also give him a powerfist works well too, reminding the viewer he is a warrior of the Imperium! Is his head from the Kataphron Battle Servitors? That is what it looks like to me, but I never looked at the kit in person. I really need to get some of them. They will provide a wealth of conversion opportunities! Thanks Adam! Glad you like it. The head is indeed from the kataphrons. An amzing kit - well worth the pricetag just for the heads and all the little manipulator arms. Sketchy doesn't even begin to cover it. There's something awkward and disjointed about the text - it reads like a twelwe year old trying to write "epic" but having no feel for the english language. Try this one from page 222: "Their attack was unsullied by doubt or hesitancy - they erupted from the ruins like thunder thought distant but suddenly overhead." Or how about sentences like "They gained Khorne's favour by betraying their comrades in bloody fashion". That's the exact wording - apparently khornate troops doesn't remove their haute couture when they go into battle. Those few lines from the book paint a grim picture indeed. 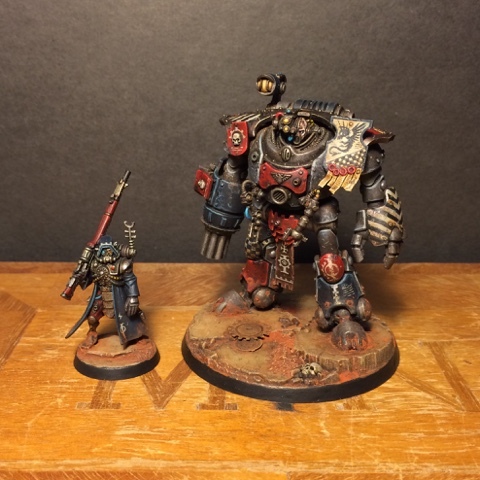 This miniature is amazing. I was not a fan of the conversion you did, to be blunt. Seeing it in grey plastic I was like whatever...but then you painted it and OMG what a beaut! Really amazing work here. It totally sings now! This looks fantastic all finished, I really like the white and black stripes on the gauntlet, a very refreshing change to hazard stripes. Overall I think you have improved the general feel of this kit for me and the potential. It's a shame to hear that aos is not working out for you (or a lot of people for that matter) I always tried to get into fantasy but the large buy in always dissuaded me, I was hoping aos would change that for me but I'm starting to think not. Cheers! The kit has loads of potential - only needs some work. Regarding AoS the rules are free to check out. The sourcebook isn't worth the money IMHO. I'd stay well back and see what happens. 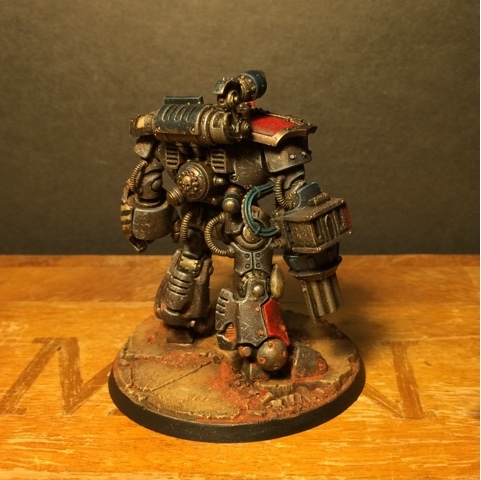 Favorite mini of the year so far :) apart from the great paint job on the minature, I particularly like the base with the sunken cogs, it really adds to the atmosphere of the piece. Regarding aos, I've picked up the starter box as I really like some of the figures and a really looking forward to painting up a force. I'm not much of a gamer these days but was hoping aos would pull me back into action. However the basic rules seem like a bit of an after thought and I really dislike the lack of a way of balancing force selection. I understand completely where your coming from regarding the new background, I was really hoping that there would be some great inspiring stories and text but everything seems rather brief and underdeveloped. I've heard that the accompanying novel is pretty good for a more gritty and expanded view of the new universe so I maybe tempted to pick it up. Regarding AoS the whole thing seems rushed which is strange considering how long they must have been working on this. What's most upsetting to me is the reboot of the fluff. The Old World was a rich and storied place, full of real drama and humanity. While the miniatures game became more and more unwieldy over time and with each subsequent edition, the background was extremely compelling (enough so that the IP was licensed out by just about everyone at some point, and completely ripped off by Blizzard as well). So, while I can be cautiously optimistic about the new game direction (but I still plan on waiting until the 2nd edition of AoS), I have a harder time embracing the new fluff. Some might like the new mythical feel of it, but even the ancient Greeks liked their gods and heroes better with human flaws and foils. A bit of personality and individual character goes a long way. I just don't see this with the new Sigmarites, or their new multidimensional universe. I would have much rather seen the Old World overrun by Chaos, and the Sigmarites coming to help the overwhelmed races reclaim it, nation by nation (sort of like a D-Day landing of Allied armies?). Sigmarites would have been a great standalone army, or one allied with a longtime player's existing ones in that case. And the Old World that was beloved by so many would still be there, underneath the iron boot of Chaos. But angels of Sigmar flying around and invading mythical realms that are occupied and run by demons and demon worshippers? It's a bit too over-the-top, and detached of the gritty humanity that allows for people to really relate to the common grunt. The imagery is great and spectacular, but I feel like it's lacking substance. Hear hear. That's pretty spot on. Thanks Morbäck! All those details were so much fun. I'm particulary happy with how the design on the kneepad turned out. Phantom Menace moment - rather well put there sir. Servitor is fantastic. All the lovely freehand markings make him look so interesting and eye catching. 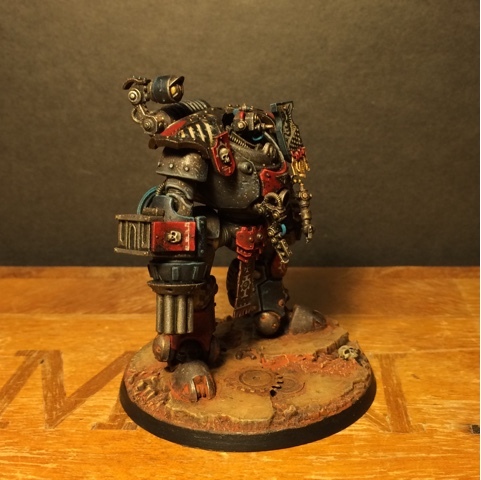 I really like this model, could you explain how you made and painted the base, please? Warhammer is dead! Long live Warhammer?